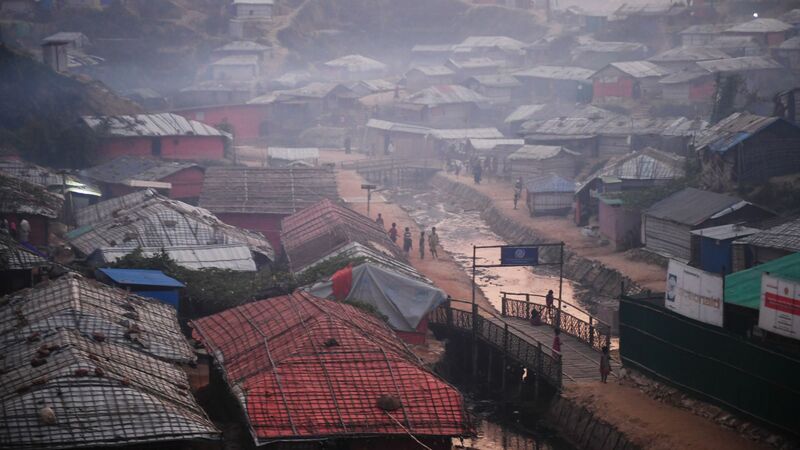 Myanmar's government has said it will close refugee camps housing 128,000 displaced Rohingya Muslims in an effort to to spur development, but a Reuters investigation has revealed the act will do little to restore freedom of movement — meaning the situation in Rakhine state will remain largely the same for a group UN investigators suspect has been targeted for ethnic cleansing. The big picture: While the government of Aung San Suu Kyi builds more permanent homes next to the camps, Rohingya refugees will be unable to return to the areas from which they were displaced. They remain to subject to official checkpoints and threats of violence, essentially causing them to be cut from "sources of livelihood" and dependent on humanitarian aid, according to Reuters. Vice President Mike Pence told Myanmar's de-facto leader Aung San Suu Kyi on Wednesday — while sitting next to her at a press conference in Singapore — that her country's violence against the Rohingya Muslims is "without excuse," NBC News reports. Why it matters: Suu Kyi has remained silent as hundreds of thousands of Rohingya fled to Bangladesh and thousands more were killed at the hands of Myanmar's military, causing some international organizations to strip her of awards given for her previous work on human rights. Pence also addressed the jailing of two Reuters journalists in Myanmar who had been investigating deaths of Rohingya, telling Suu Kyi it was "deeply troubling to millions of Americans."